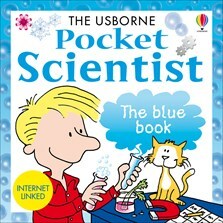 A fabulous, pocket-sized guide that tackles the mysteries of everyday things, from nature to science and technology. Simple text and colourful pictures answers questions such as “How do animals talk?” “Why are people different?” “What makes you ill?” “Why is night dark?” and many more. Includes simple experiments to do at home, and links to websites with online activities, experiments and free downloadable pictures. In a handy pocket-size and packed full of information...a meaty introduction to the science behind everyday things such as how we communicate, how we stay healthy and how machines work. The book provides good links to internet sites to make it easy for readers to search for further information if they want to.